You may notice that the guaranteed analysis on NomNomNow appears lower than your current diet, particularly if your pet is currently eating a kibble. Fresh food is much less calorie dense than a dry food that has been processed and condensed, meaning it takes a larger volume of fresh food to achieve the same calorie amount as dry kibble. This is due to the high moisture content of the food. If you reference and compare the guaranteed analysis of dry food and NomNomNow, you will notice that the calories per ounce will be very different. You will also notice virtually no moisture in the dry food which affects the guaranteed analysis percentages. Rest assured, all of our recipes here at NomNomNow are formulated by a Board-Certified Veterinary Nutritionist and Veterinarian to provide all of our pets with a balanced and complete diet, not one deficient or lacking in key things like proteins. 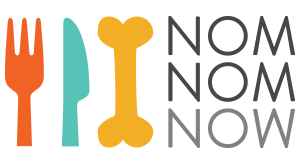 If you'd like to compare protein and fat values of your current dog food with NomNomNow, simply use our Nutrient Calculator! Learn more from our Veterinary Nutritionist Dr. Justin Shmalberg on how to accurately read dog food labels, to understand the amount of protein inside a fresh dog food label, and any other!